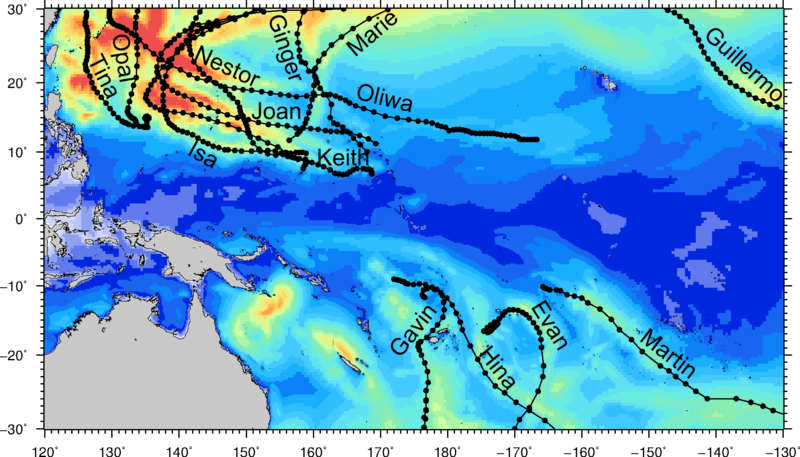 El Niño and La Niña have a huge impact on the wind and wave patterns in the Pacific. This page describes how the waves are affected. El Niño is part of the El Niño Southern Oscillation (ENSO). ENSO can oscillate between phases, El Niño is a warm phase, La Niña phase is the cool phase and then there is a neutral phase (See links below for more details). The El Niño phase has a profound impact on the wind and wave pattern across the Pacific. The items below describe some of the impact of El Niño on the wave climate in the Pacific. One of the most striking signs of El Niño is the much warmer sea surface temperature at the equator. The abnormally warm water provides extra fuel for Typhoons and Hurricanes. So during the El Niño phases of ENSO, there are much higher chances of Typhoon and Hurricane swells being generated. This is particularly obvious when we compare the number of Typhoon between 1996 and 1997 (Below). Maximum wave height in 1997 (Jan-Dec) - At least 9 major Typhoons and 2 Hurricanes created a significant swell. El Niño is associated with a slowdown and even a reversal of the equatorial Easterly trade winds. This commonly happens in the summer time during El Niño phases where strong westerly winds blow. During El Niño, relatively large wave events can be generated by these strong Westerly winds and can cause problems of erosion and inundation. 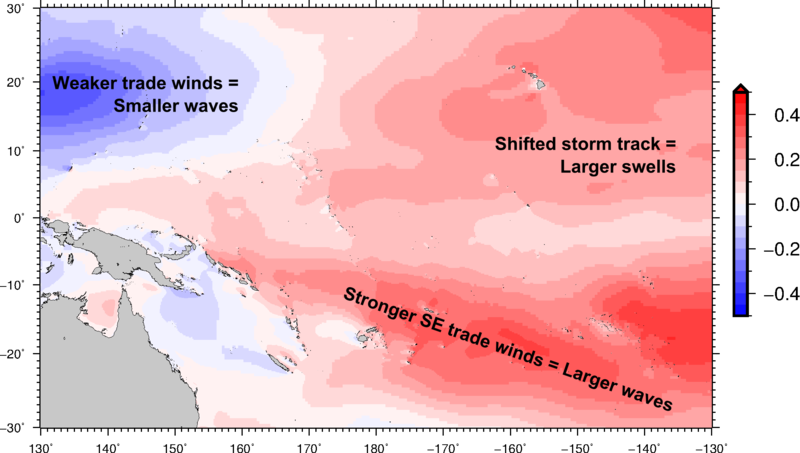 The South East trade winds over Fiji, New Caledonia, Tonga and Samoa get much stronger and more consistent, bringing larger wind waves. 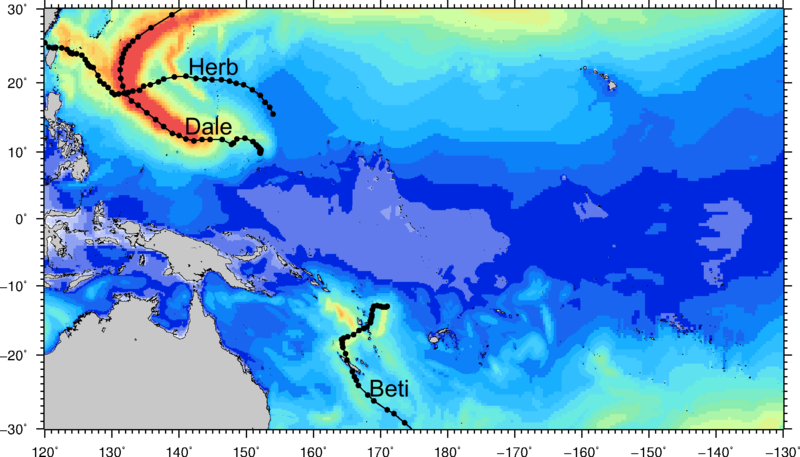 It creates a sea surface temperature anomaly that reduces the chance of Tropical cyclone forming and moving to Fiji, New Caledonia and Tonga but increases the chance of Tropical Cyclones in Samoa. El Niño, during the North Hemisphere winter (Dec-Feb), tend to shift storm track further South East than usual. Although these storms do not typically reach Pacific island countries (except Hawai'i) the swell they generate is larger and more frequent than usual. Larger swell can cause a significant change in sediment transport which, during strong El Niño, can lead to significant coastal erosion. 1998 mean wave anomaly - Difference between the 1998 mean wave height and the 34 year average. Red mean waves are higher than normal and blue is waves are smaller than normal.